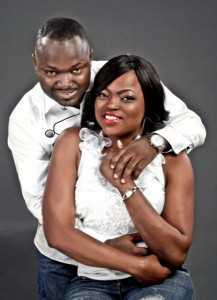 Newspapers and blogs (we plead guilty as charged) have been on a roll since actress and producerFunke Akindele unveiled pictures of her fiance, Kehinde Oloyede Al-Maroof. The marriage date is fixed for May 26. It’s clear from the photos, no matter the criticisms about the man being married or too old, that she is happy and can’t wait to be Mrs.
She confirmed that in an interview published by Punch today. it means to be in love. I am in love and I am not ashamed to say so,” she said. Awww. All the best, sister! Truth be told,that's the only option she's got….as a glo ambassador she's worth over a hundred million naira, no young and single guy can afford dat, he's gon be intimidated.happy for her….. I am still amazed by how young ladies of nowadays don't ever see anything wrong in being 2nd wives of married men! Did you not learn from the mistakes your mothers and fathers made? So sad! What is old about the guy or did I read wrong? Funke your happiness is what matters most. I thank God for you and may the peace and love of God reign in this relationship.